So this is it. 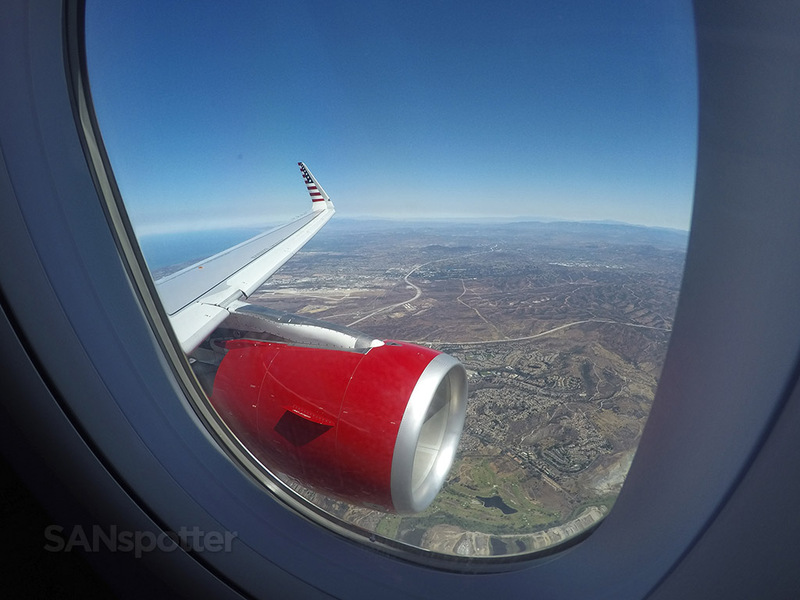 The final segment in this four-part Virgin America itinerary. 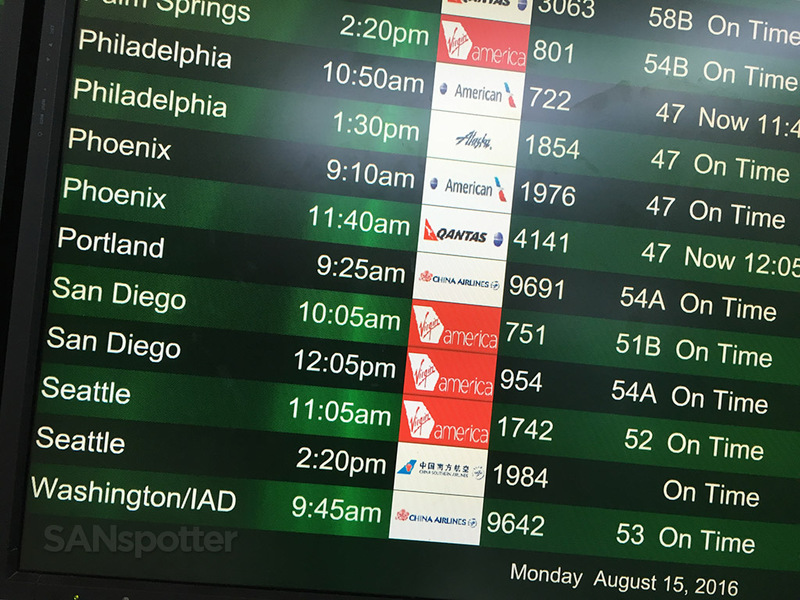 The flight from PDX to SFO was so early that I’m not really sure that I enjoyed it all that much – waking up at 3am to catch that flight was brutal! 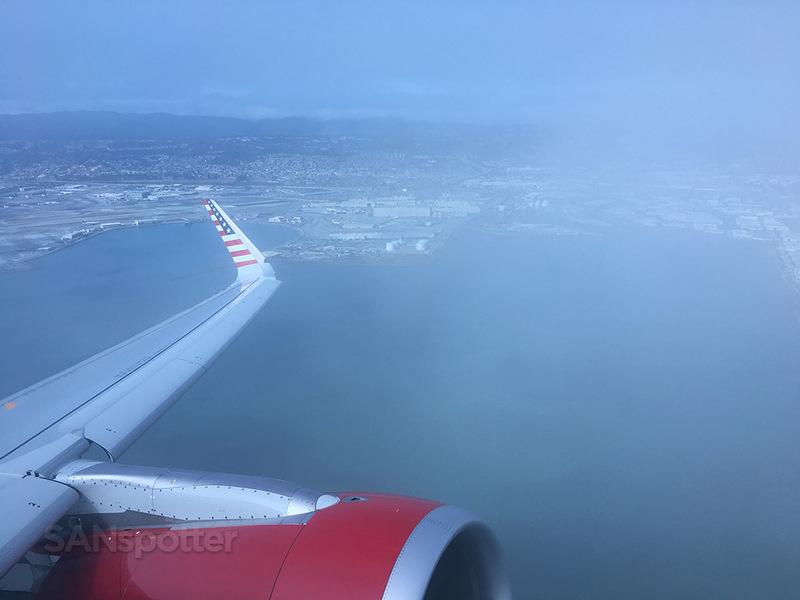 I felt like a zombie for nearly the entire thing, but the good news is that I started to wake up a bit as we were approaching SFO. 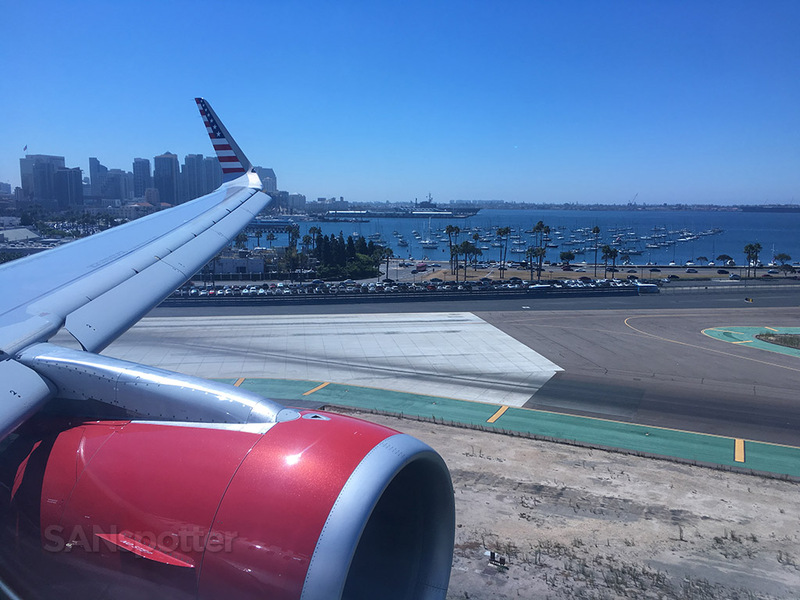 I needed breakfast though – so that was the first plan of attack during my 1.5hr layover before hopping on this final segment down to San Diego. 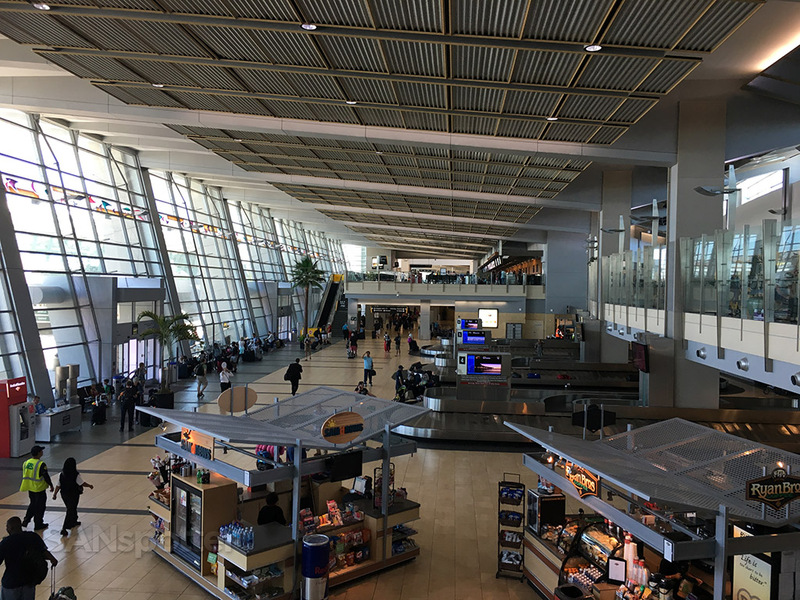 Inside Terminal 2 at SFO – the search for breakfast is on. 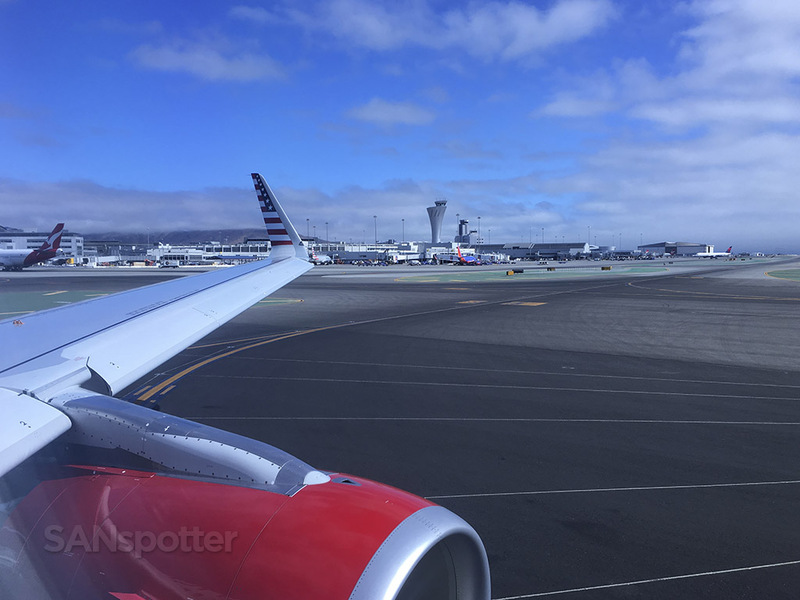 Virgin America flight number 751 to SAN showing as on time. Perfect! This flight represented the end of this trip report, and after all the filming and picture taking I had been doing on all three of the previous flights in this itinerary, it felt good to slow down a little and not worry so much about documenting every detail. 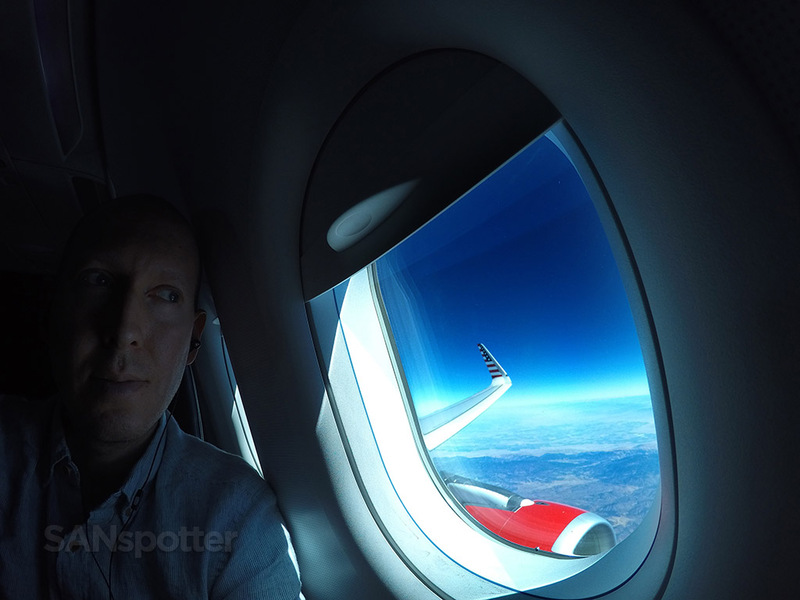 After all, I had shot over 50GB of pics and video during the previous three flights, so I felt pretty confident I had enough content to document the Virgin America experience quite well for SANspotter.com. I still took a ton of pics of course, but I wasn’t so worried about trying to capture every single detail. 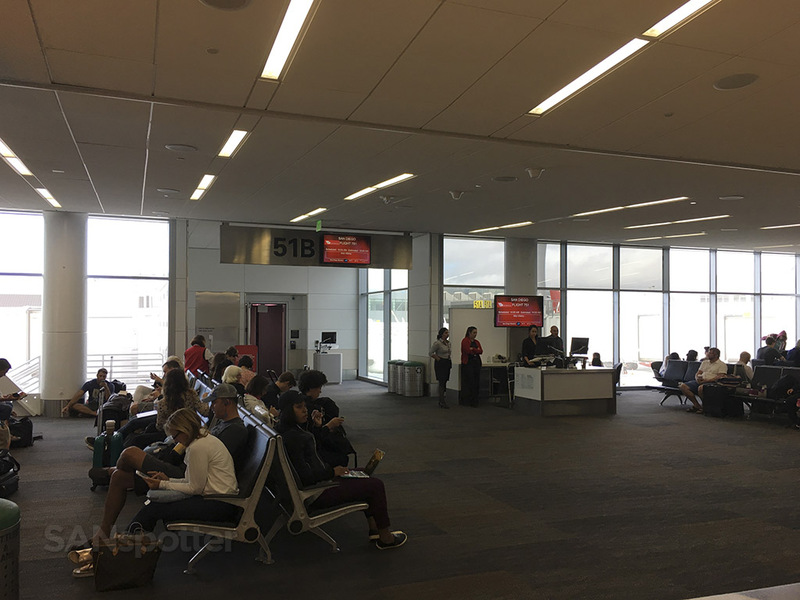 51B was the gate for the flight down to San Diego this morning, which just so happened to be the exact same gate that was used for my SFO-PDX segment two days prior. I didn’t realize it at first, but I started having a feeling of deja vu while standing in line ready to board the plane. 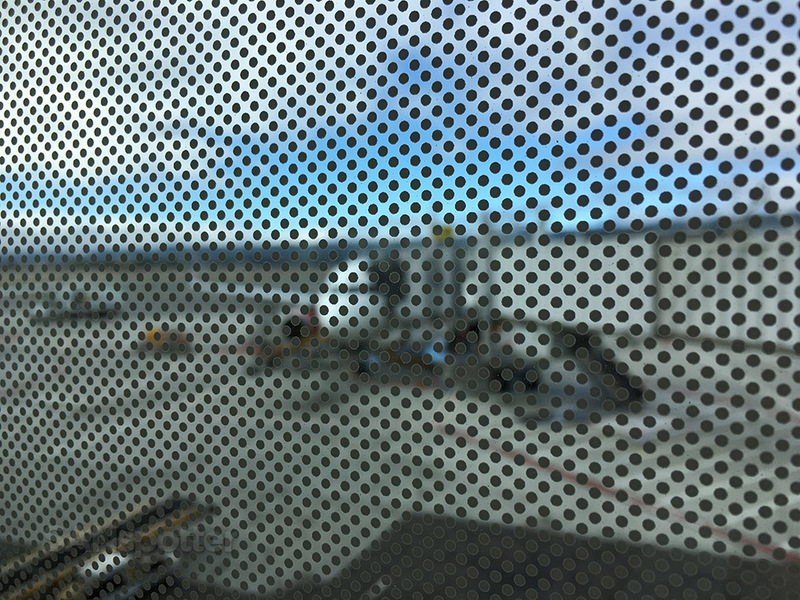 Not a very good view of our aircraft from this gate unfortunately. 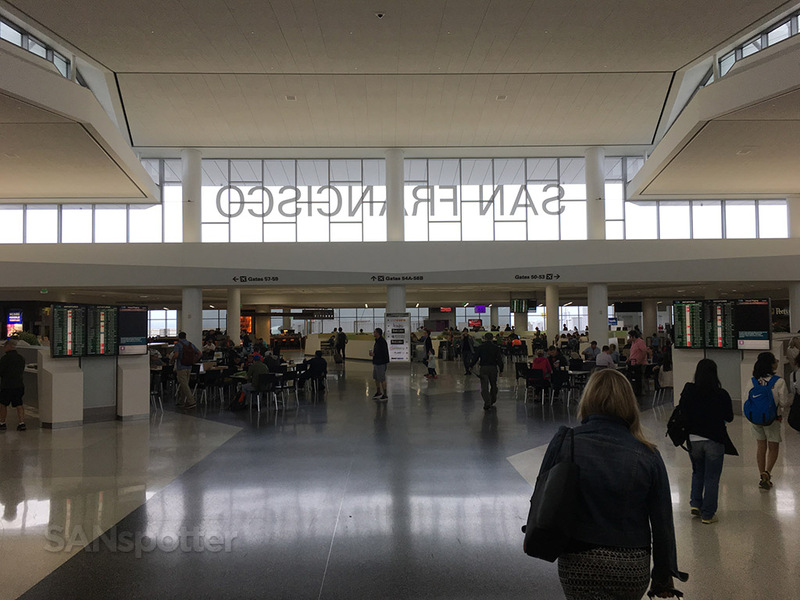 Gate 51B – the same one I departed to PDX from two days earlier. Another thing that I noticed was the large amount of business travelers compared to my flights last Saturday. The crowd was completely different today. On Saturday it was mostly college kids and families, but today (Monday) it was business travelers juggling cell phones and laptops. It’s been a long time since I’ve traveled for business like that, and it reminded me how stressful of an experience it can be. Flying for leisure is much more fun! 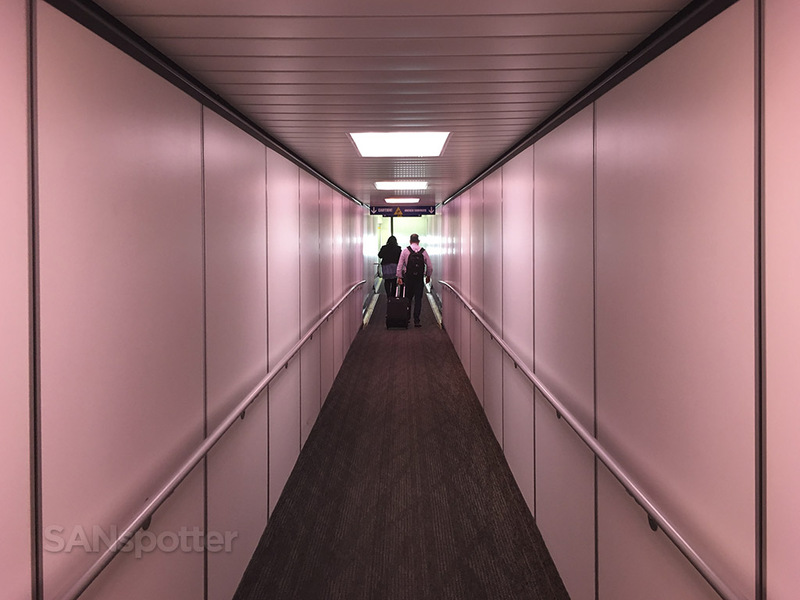 That cool pink mood lighting begins in the jetway. Nice close up look of N363VA just before I stepped onboard. My seat for this segment down to San Diego was 3A, which was a proper Main Cabin Select (premium economy) seat in the very first row of the main cabin. 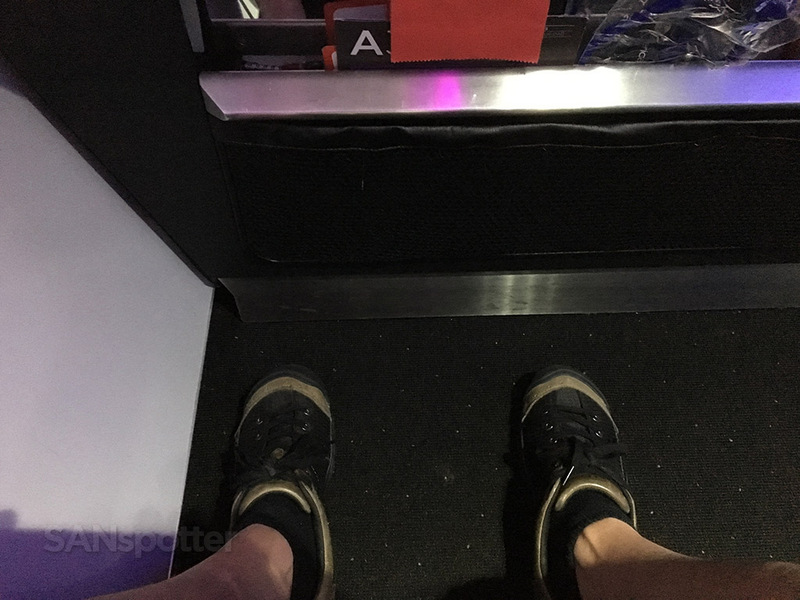 Right away I found this to be a decent seat with miles of legroom, but the downside is that there isn’t a place to store a small carryon on the floor – everything must go in the overhead bin. For that reason alone I think I prefer an exit row seat in row 10 over this one in row 3. Being at the front of the plane (just behind first class) was nice though. Main Cabin Select seats 3A, B, and C.
There’s no room for small personal items here – all belongings must go in the overhead bin! 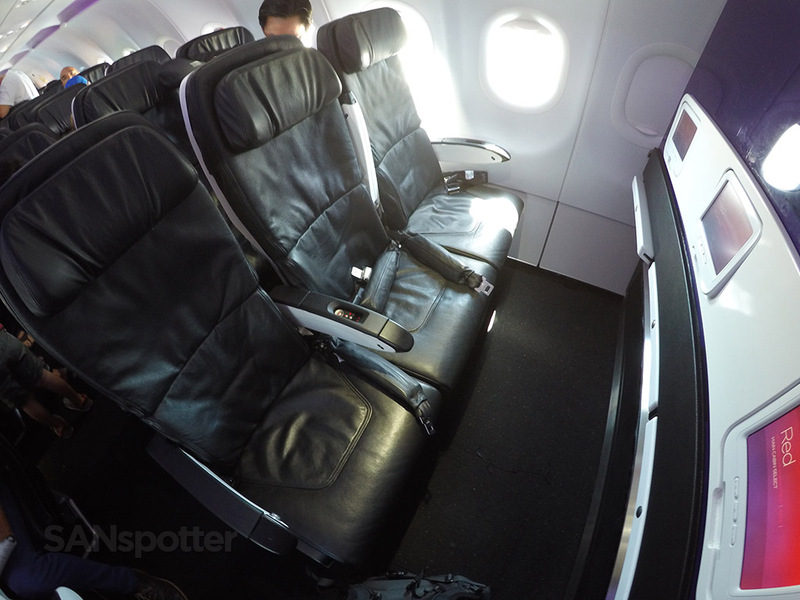 Virgin America Main Cabin Select (premium economy) row 3. 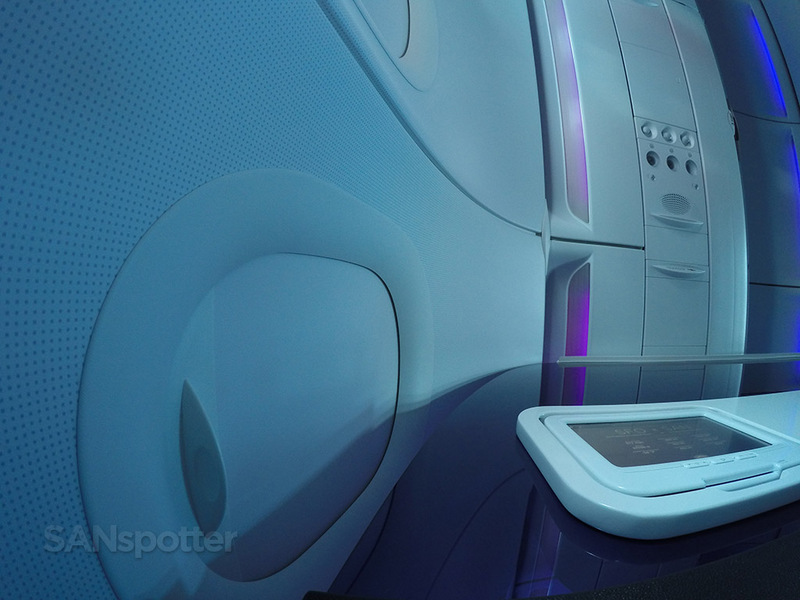 The translucent purple bulkhead wall is super cool. 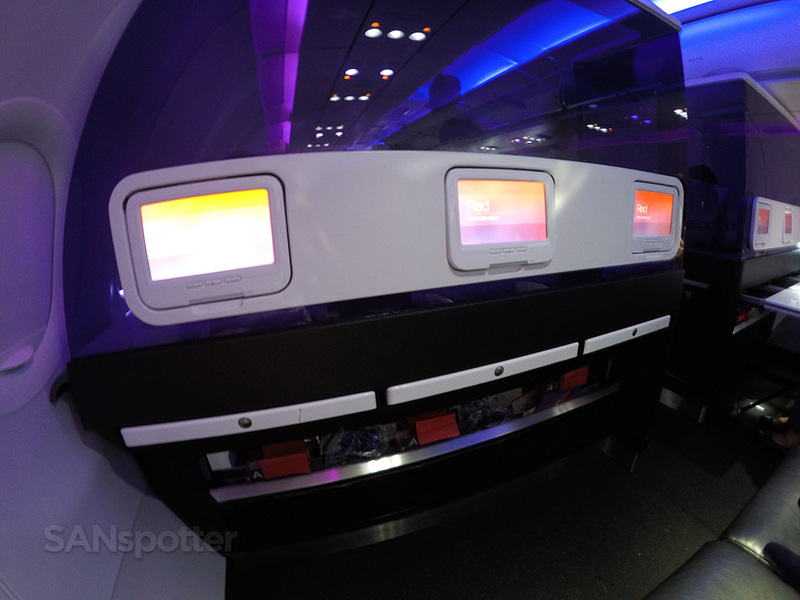 The personal video screens are integrated nicely into that bulkhead wall. The boarding door closed with the middle seat next to me empty, which is always such an awesome feeling! It’s not like I am anti-social or anything, but I do like my space and being able to spread out a little. 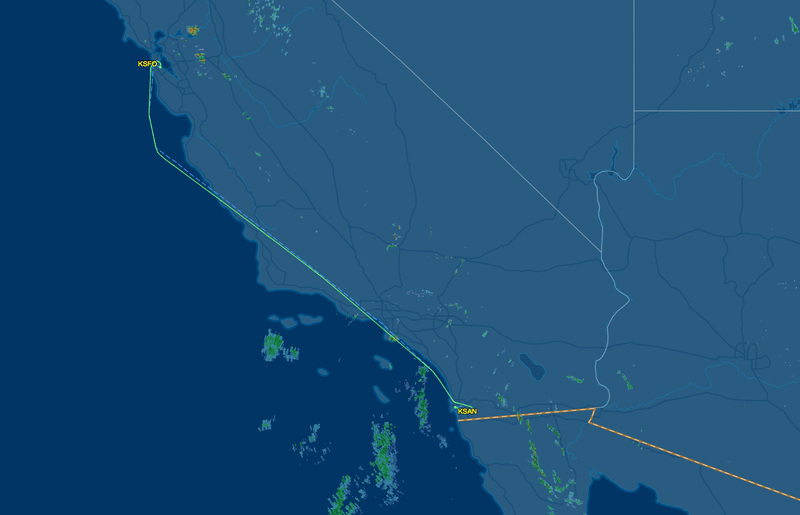 Of course it doesn’t matter so much on these shorter flights but it’s still nice nonetheless. Pushing back from the gate. We’re on our way now! Just the same as two days prior, our departure runway was 1R. 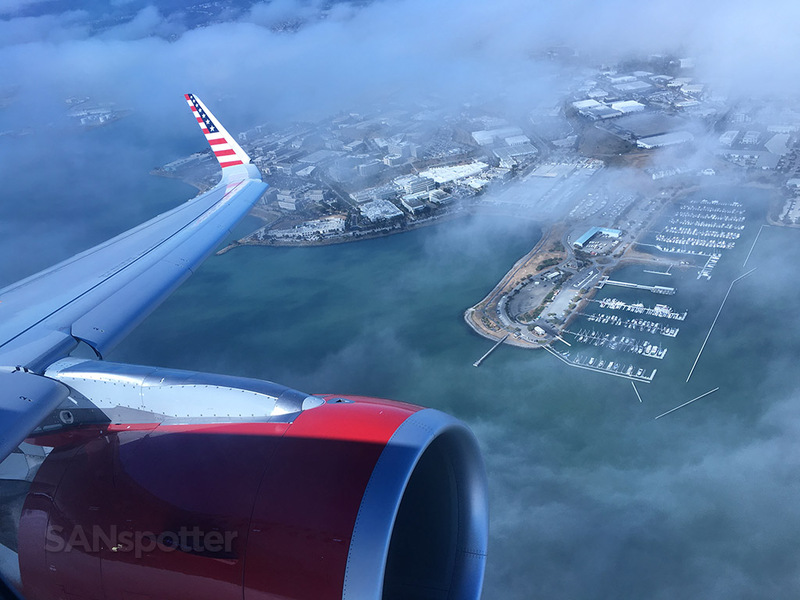 Even better than last time, however, was the fact that I was seated on the other side of the aircraft which made for better photo opportunities. 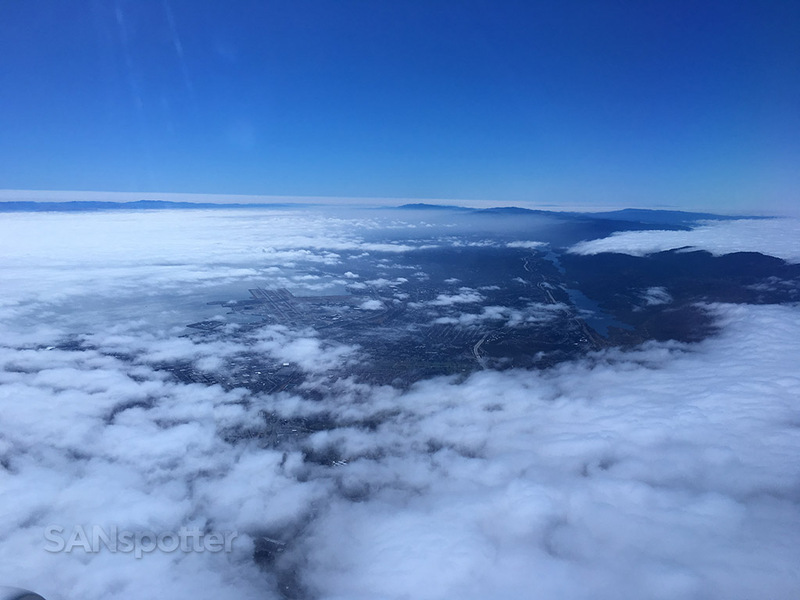 It’s always difficult to decide which side to sit on for mid-day flights like this, as the sun is usually directly overhead and photo ops aren’t very good on either side for most of the flight. 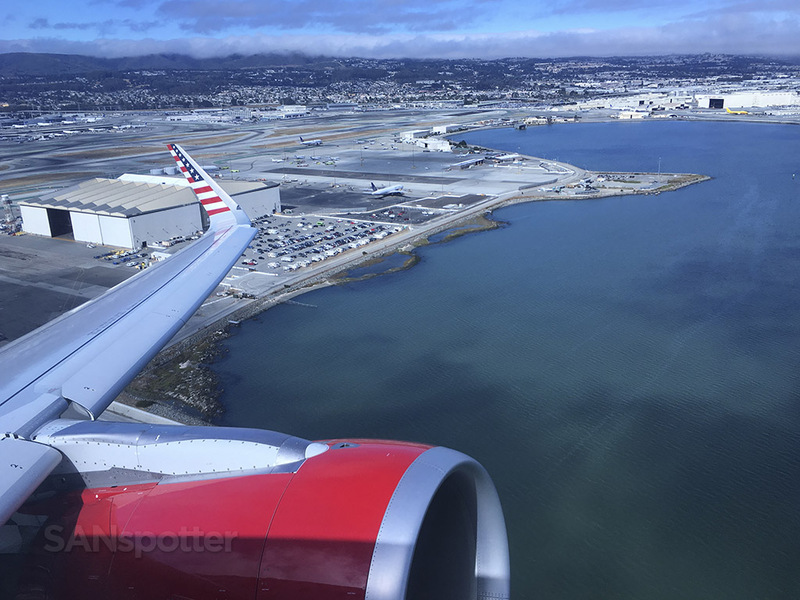 But I felt satisfied with this choice based purely on the views of SFO I was able to capture on our departure. 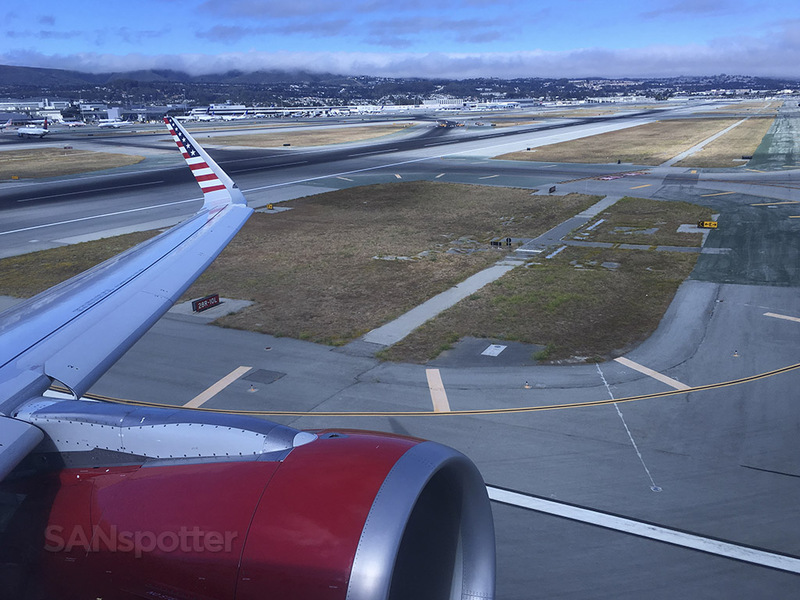 Taxiing out to runway 1R. Looking straight down runway 1R. And we’re off! 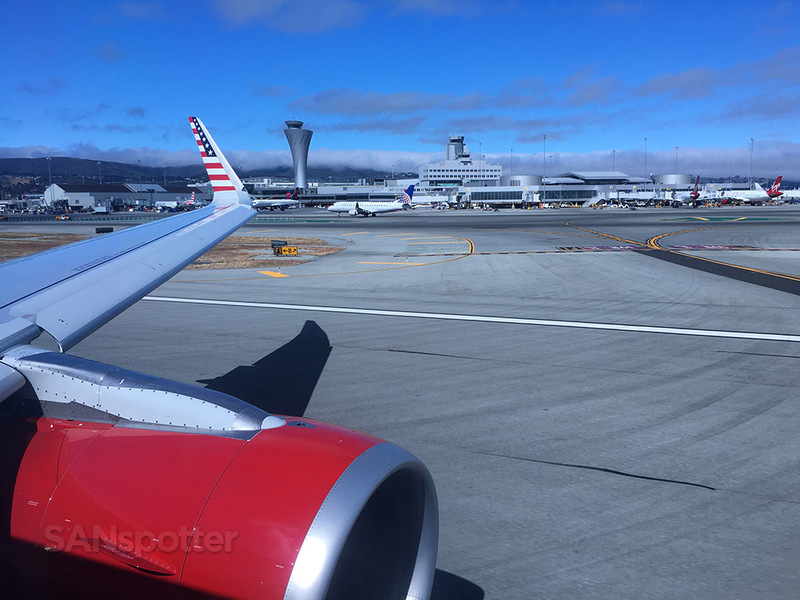 That Qantas 747-400 in the background surprised me – I was unaware that QF had resumed service to SFO. 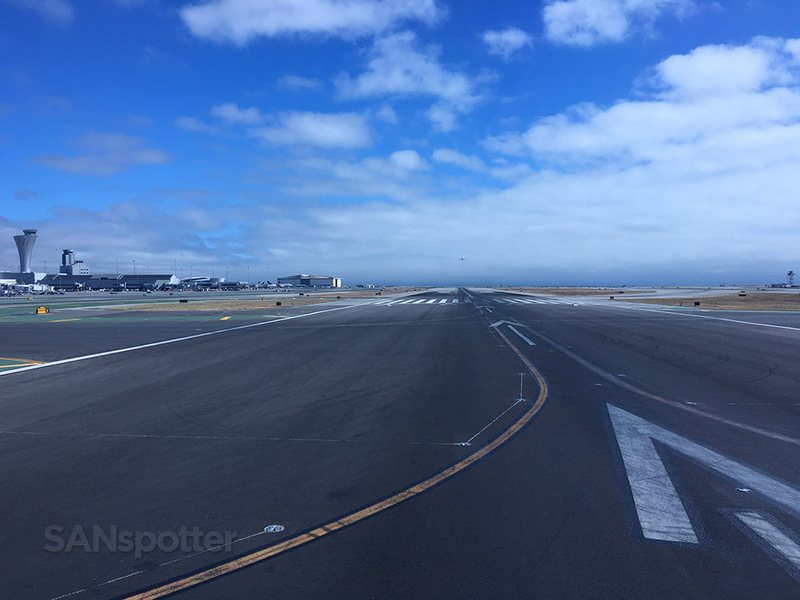 I haven’t experienced many 1R departures from SFO, so the views were especially interesting today. It wouldn’t be San Francisco without the fog, right? The combination of fog and sun made for some really beautiful scenery during our departure! Time to sit back, relax, and enjoy the ride down to San Diego. 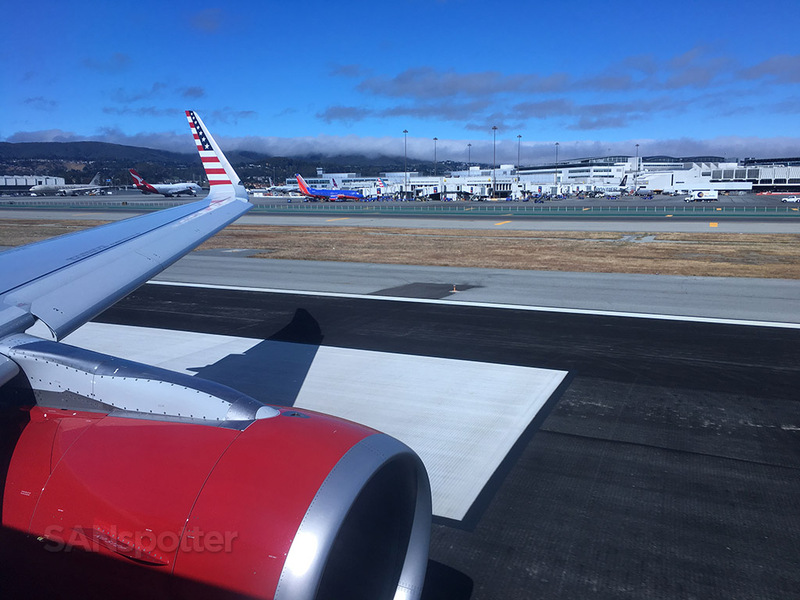 Flying time from SFO to SAN is relatively short. Only 59 minutes to go! 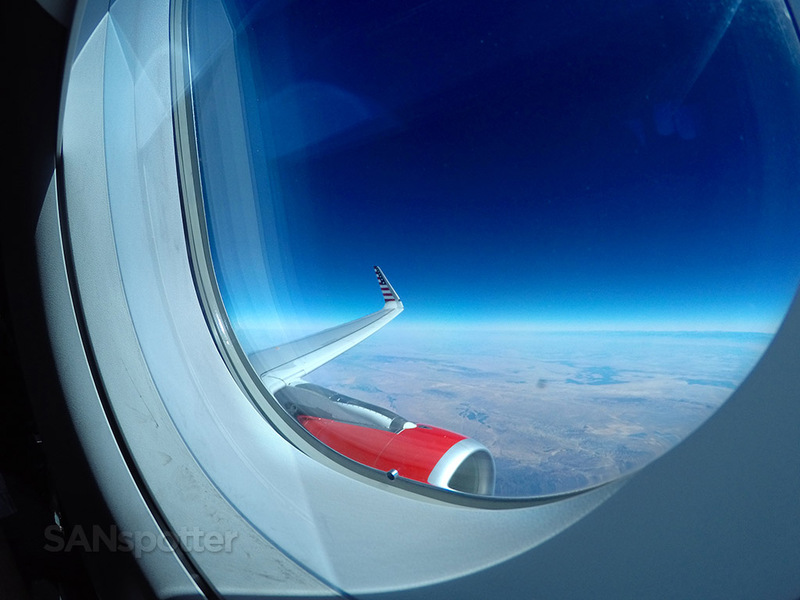 I played around with my GoPro camera for most of the flight trying to get some decent profile pics for this blog and my social media accounts. I hate doing stuff like this when someone is sitting right next to me (I feel too self-conscious!) but I went to town on this flight. Unfortunately I didn’t get anything I’m totally happy with, so I’ll just have to try again some other time. Just goofing around with my GoPro camera. This is the cabin wall and ceiling from a different perspective. That’s me, trying hard to think of cool pictures to take for this trip report. 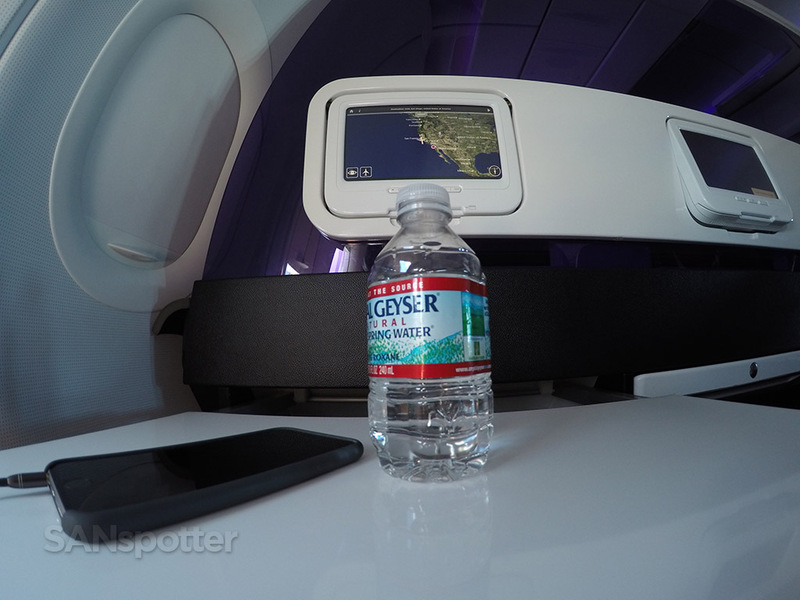 Beverage service was fast today, no doubt accelerated out of necessity by the short flight time. 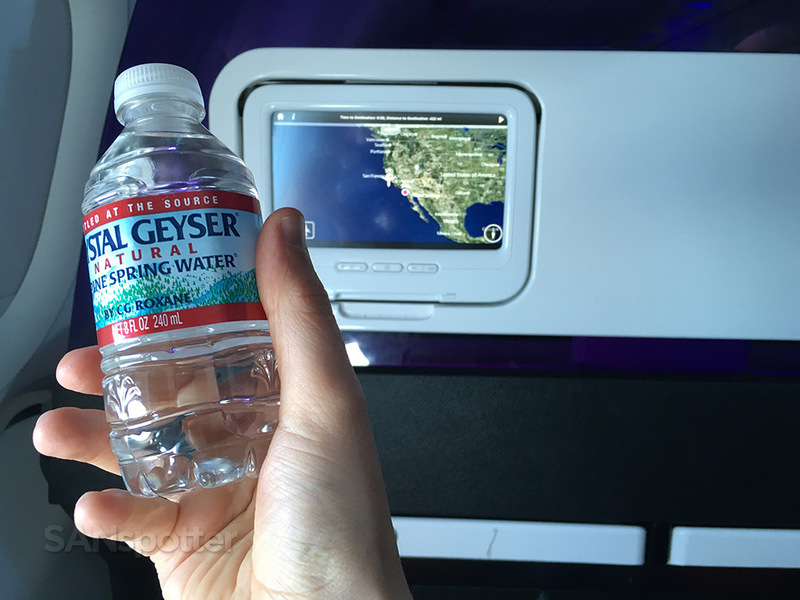 I wasn’t really all that thirsty, but yes thanks, I will take a water just to make this trip report more complete! No lobster or prime rib service on today’s flight. Bottled water is as good as it’s gonna get. Flying high above California’s central valley. 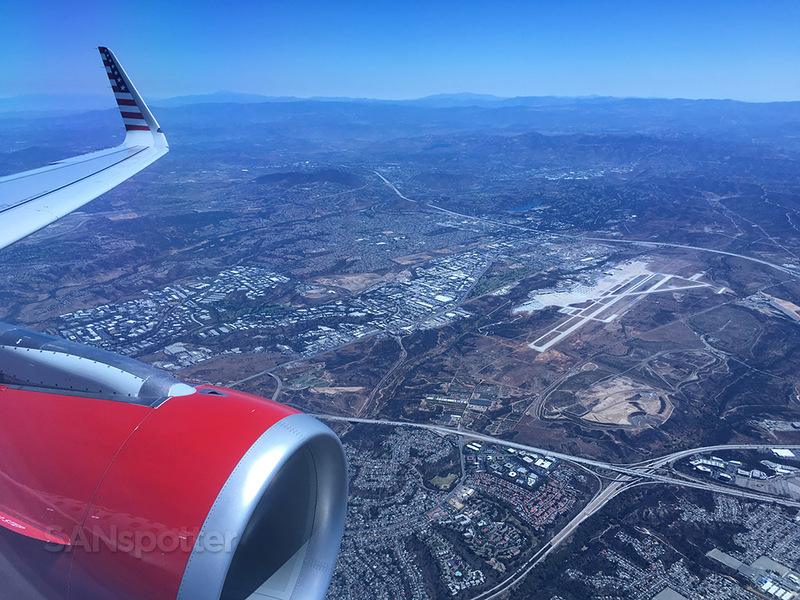 Those of us on the right side of the aircraft were treated to very nice aerial views of Los Angeles and North County San Diego on our way down, and I even managed to spot the building that I work in. 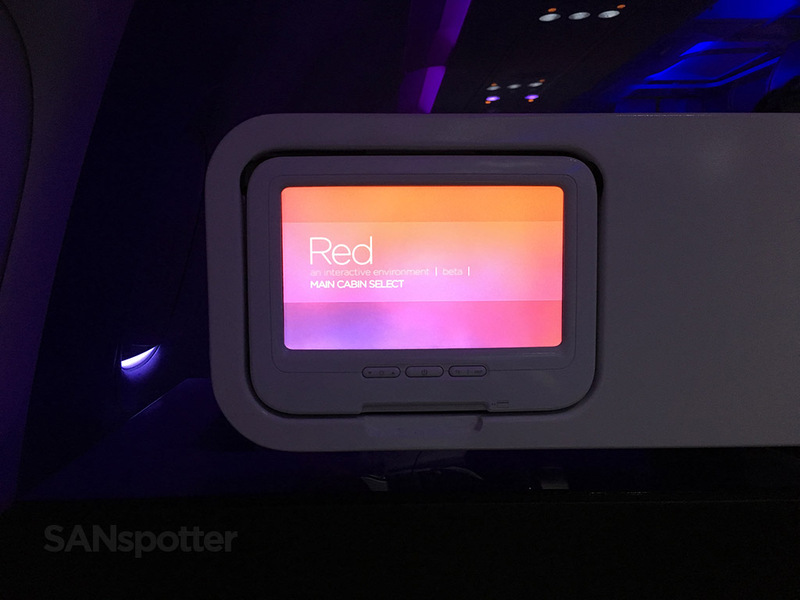 I felt sorry for all my coworkers who were working hard down there while I was living it up in Virgin America Main Cabin Select. 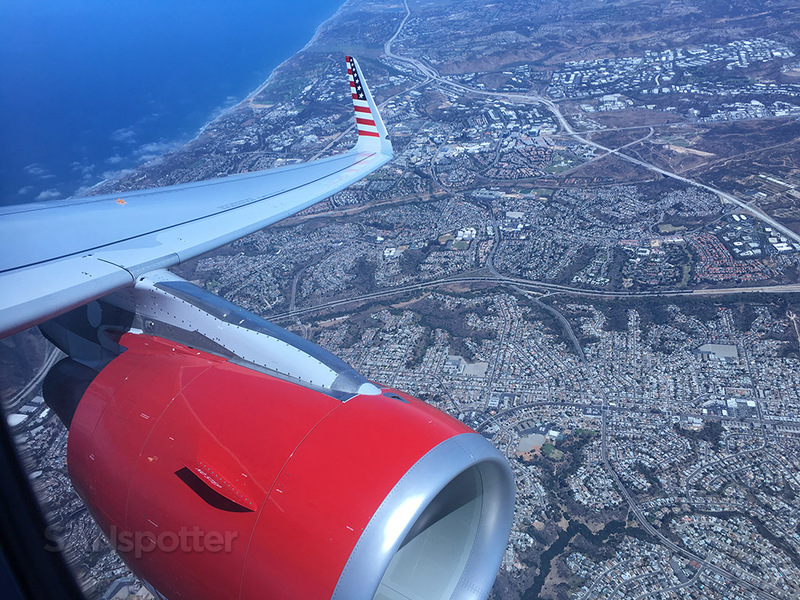 Flying right over top of my house now as we turn inland over Del Mar and La Jolla on our approach into SAN. Looks pretty dry down there, doesn’t it? That airport is Miramar MCAS (a US Marines air base). 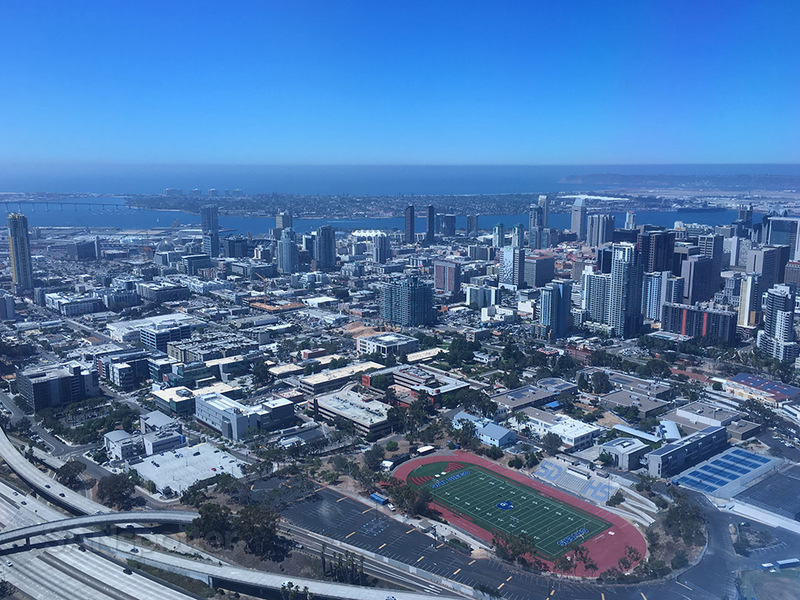 So good to see you again San Diego!! 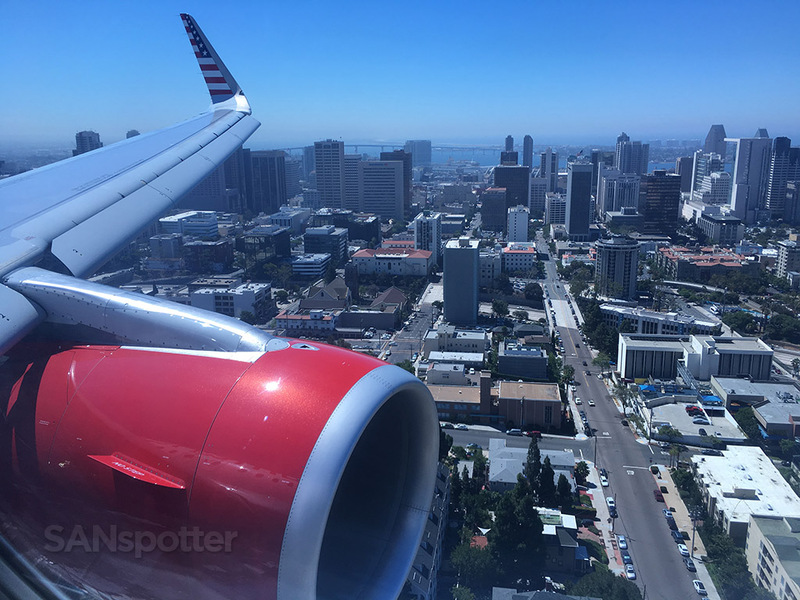 Overflying downtown San Diego with the Coronado Bay bridge in the background. That’s the cruise ship terminal to the right. 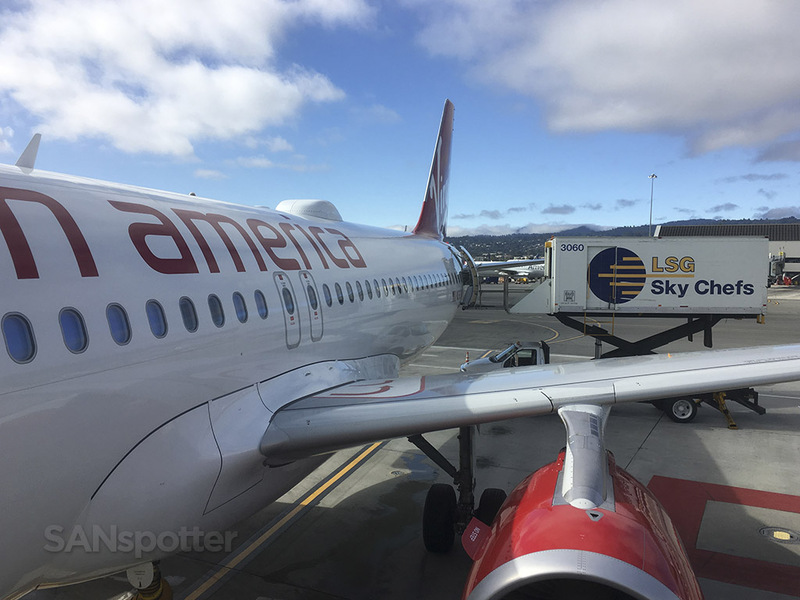 Sky Surfer getting a much needed rest here at gate 35 before heading back up north to SFO. Thanks for the ride today! Baggage claim at SAN. So good to be home! 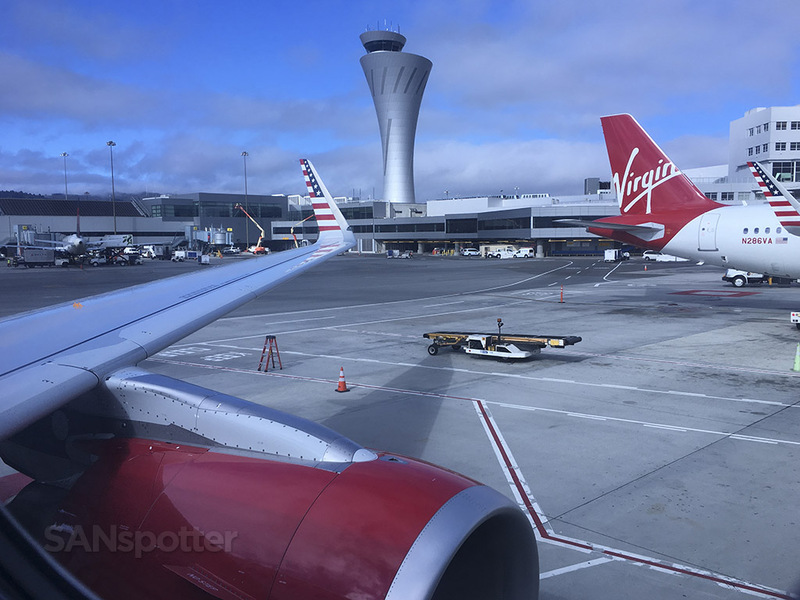 That wraps up this “farewell to Virgin America” trip report. 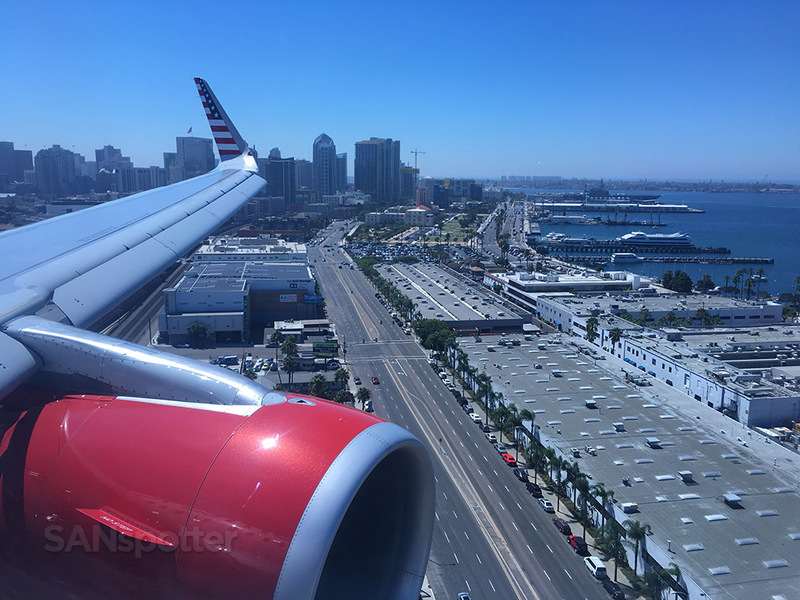 Once on the ground in San Diego, I felt confident that now, no matter what happens to VX, I had the chance to experience this airline at a fairly deep level. 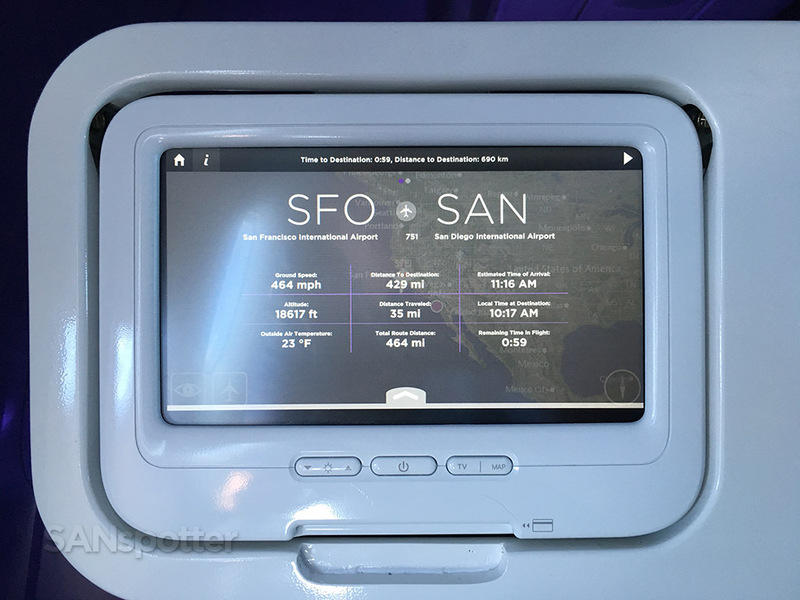 No, I still haven’t flown a transcon in first class with them (just to see how they compare to jetBlue, American, United, and Delta) but the first class flights I had on VX two years ago to SFO and back from SAN led me to believe that it’s a decent premium product. Not competitive at all with other premium transcon products on other airlines, but better than “normal” domestic US first class. And now that I’ve had the chance to experience their economy and premium economy offerings, I’m really going to be sad when Alaska Airlines pulls the plug on this great airline for good. 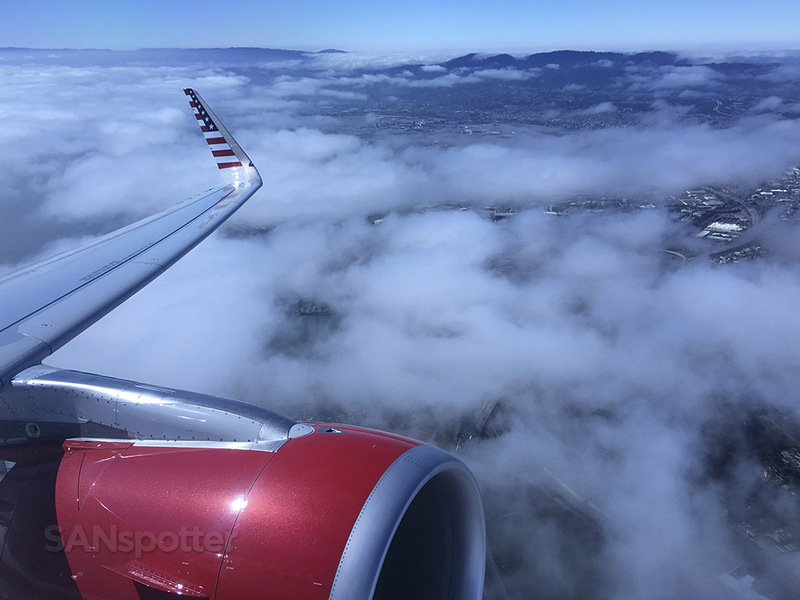 The employees are passionate, the planes are hip and cool, and the entire Virgin America experience oozes with style. 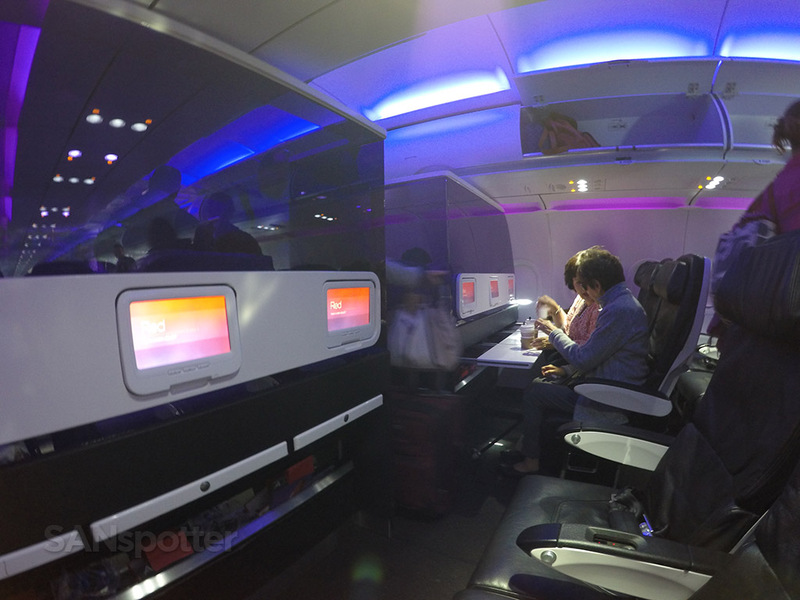 The US needs an airline like this, if for no other reason than to have an option that isn’t dull and corporate. 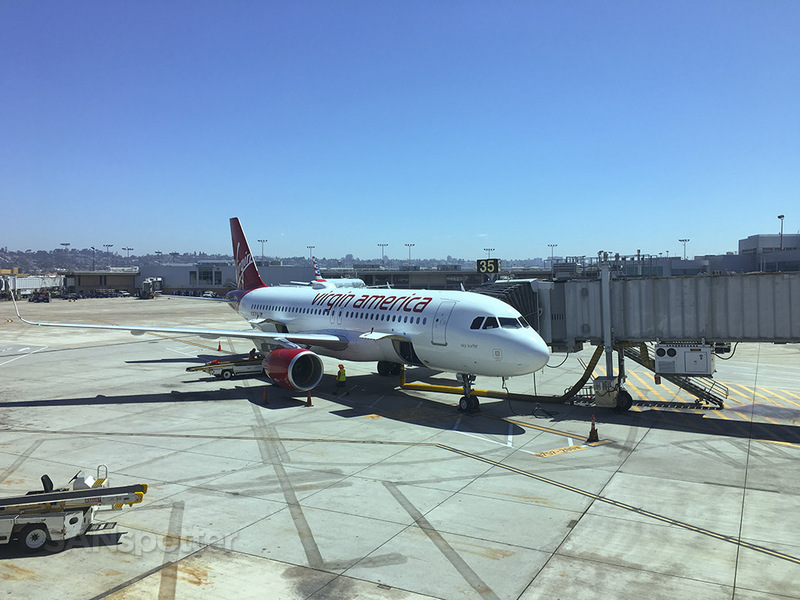 You will be missed Virgin America.